We know the spring game doesn’t count, but Clemson tends to do things a bit differently to make things more realistic. After drafting teams earlier this week, the Orange and White game will decide which unit has the right to have a day off from training. Clemson’s two-time national championship-winning head coach Dabo Swinney always finds something to motivate his team. Today’s spring game provides fans the opportunity to see if the reigning national champions, looks like a team that can make a fifth consecutive run to the College Football Playoff. The spring game provides an opportunity to check out the new mid-year enrollees and this group shouldn’t disappoint. This year, the Tigers brought in three freshmen wideouts on offense and Swinney said the staff “hit a home run” signing them. 5-star wide receivers Frank Ladson‍ and Joseph Ngata‍ have already impressed and Brannon Spector‍ seems to be finding his place as well. Travis Etienne told us recently that Ngata reminds him of former Dallas Cowboys wide receiver Terrell Owens. Those are big words for sure. Ngata, who seems a cool as they come shouldn’t get caught up in the bright lights and playing in front of what could be a record spring game crowd in Death Valley. With a national television audience watching, Ladson will also provide an impressive look at how far Clemson’s recruiting has come. The Tigers went into Miami and pulled out an elite prospect, giving them riches beyond measure at receiver. Look for Ladson and Ngata to see several deep balls this afternoon. When you mix in Spector, who has a review from sophomore corner Mario Goodrich comparing his quickness to Hunter Renfrow. Swinney wasn’t ready to go that far, however, but the head coach wasn’t disappointed either. “He can run, he’s explosive. He’s got great size, and good range and good ball skills. He’s just a different type of player than Renfrow. He’s going to be really good,” Swinney said. It’s also worth noting that Spector will be wearing the No. 13 jersey on Saturday. With the injury to Amari Rodgers, and Derion Kendrick getting reps at corner, keep an eye on Spector as he has a chance to potentially find time in the slot this season. 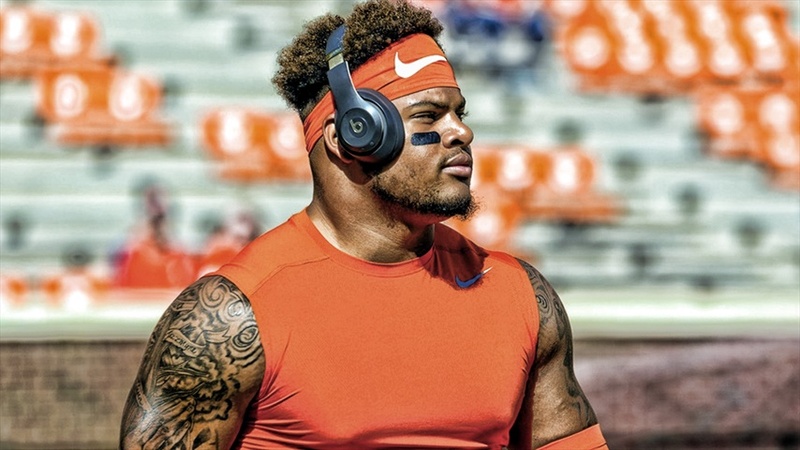 Sophomore defensive end Xavier Thomas will be counted on to disrupt up front for Clemson in 2019. Xavier Thomas burst on the scene a year ago and after waiting patiently for his opportunity, the sophomore from Florence has a chance to become a disruptive force. Thomas will be counted on as one of the leaders in 2019. Add in the fact that Nyles Pinckney and Jordan Williams are out and you can expect to see some new faces getting plenty of snaps. “Practice is a lot different for me now because last year, I just watched and got a few reps but this year, I’m getting more reps and I’ve got to prepare my body differently,” Thomas said. Tyler Davis is a name we’ve heard all spring and a guy that Swinney says “is above the curve for a typical kid walking in.” Fans will get their first glimpse of him along with other young guys like Etinosa Reuben and Ruke Orhorhoro, which Thomas says all of them have grown throughout the spring. B.T. Potter returns for his second season at Clemson and should continue to be a weapon on kickoffs. We noted at the beginning of the spring, teams weren’t able to field kickoffs when Potter was in the game a year ago. Swinney recently said that the biggest thing the sophomore kicker needs to do is become more consistent. At punter, Will Spiers and freshman Aidan Swanson have been battling it out. Spiers has the advantage in terms of experience, but after an inconsistent 2018 season for Spiers, fans would like to see some improvement. As for Swanson, Swinney has been impressed with him so far and today’s efforts could introduce an expanded storyline at the punter position before the fall. “Aidan is a guy that I think, through the summer getting a little bit stronger and then coming in here (in August), he’s going to definitely have an opportunity to compete. He’s a special talent and then you throw in the fact that he’s a left-footed guy is pretty exciting to see that ball come off his foot because it’s just different,” Swinney said of Swanson. Two-way player Derion Kendrick will get to showcase his defensive skills in Clemson’s spring game later today. It still feels strange typing this, but wideout Derion Kendrick has become a focal point of this position group. Like Ray-Ray McCloud two years ago, Kendrick has been called on to take some snaps on defense and according to Brent Venables would be a starter if the season started today. 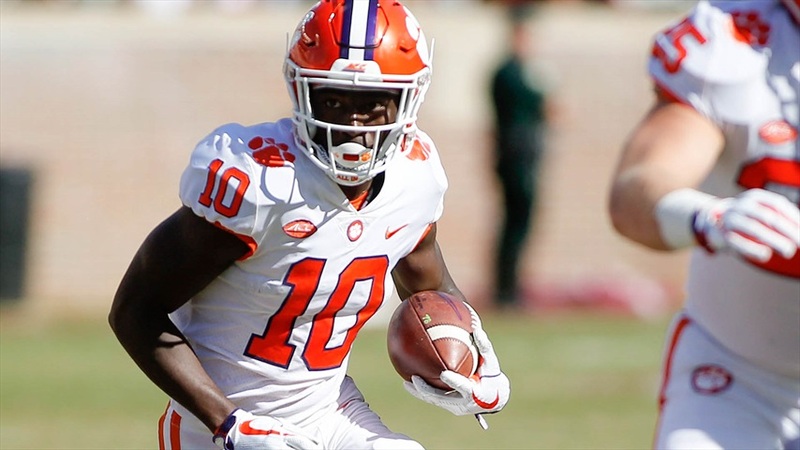 Clemson has needed the help in the secondary due to a lack of bodies at that position, and when we spoke with Kendrick last week, he told us it doesn’t matter what position he’s playing, he just wants to be on the field. Now, fans will get their first chance to see how well he has adjusted to his new role. 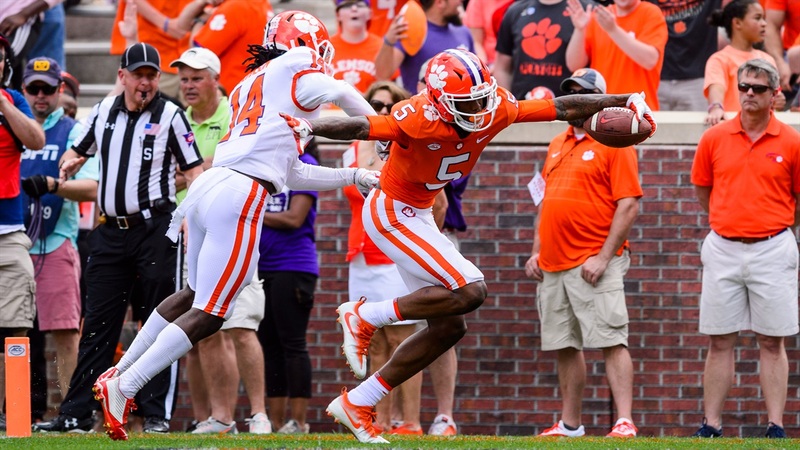 This could become the story of the offseason as Kendrick, a former 5-star recruit could change the look in Clemson’s 2019 secondary. Last year, the group finished on a strong note, with a good performance against Alabama, but they will be challenged by the talented receivers. We asked Mario Goodrich about going up against the talented freshman core. His response? “I feel like we’ve got one of the best receiving cores in the country so, it’s helping the defense get better.” Goodrich said. Follow all of these storylines and more as Clemson’s spring game kicks off today at 2:30 on ESPN2.